The President candidate from the Republican Party in 1940 - Wendell Lewis Willkie was born on the 18th of February in 1892, in Elwood, Indiana. He studied and got juridical degree in the Indiana University. After graduation it was the First World War time, so he joined the armed forces of the U.S. and did military service in France. In 1929 he moved to New York to work in the Commonwealth and Southern Corporation where he got an opportunity to show himself as the talented lawyer, and in 1933 he became its president. Back then he joined the Democratic Party, and promoted the campaign of Newton D. Baker to run for president from the Democratic Party. However, the Franklin D. Roosevelt was chosen. As a person Wendell supported the president and his views, but his Commonwealth and Southern Corporation and some other utilities contradicted with the project of Franklin D. Roosevelt's Tennessee Valley Authority project. The company believed that President competes with them using benefits from his power. Wendell Willkie used to stand proxy for his company and the power industry, running the negotiations and case with President's project. His commitment to his company led to the disreputableness, and he changed the political parties in 1939. He stood against the New Deal policies of Roosevelt, as he believed them to be inefficient for business. The Republican Party elected Willkie as the candidate for the President. However, he didn't win the election, gaining 45% and Roosevelt got 55%. With the outburst of World War II Willkie and Roosevelt worked together to make the political situation better and join forces. Willkie traveled abroad with special missions from the President and even hand-delivered the letter to Winston Churchill. Having a nervous life, he suffered from numerous heart attacks and passed away in 1944. He was 52. 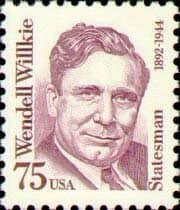 The series of Great Americans definitive 75 cents stamp was issued with Wendell Willkie on February, 16, 1992, honoring his 100th birthday.